Typhoon Hagupit slammed into Samar Island in the Philippines a few days ago. I believe that in part through your prayers, the destruction of Hagupit is not as bad as with Typhoon Haiyan which decimated the island of Leyte in 2013, with 7,000 deaths. Our friend Lyn Ramirez from Miami is from Leyte Island. Her 80 year old mother Bebing Albizo and family suffered incredible devastation from Haiyan. Since Leyte Island is next to Samar Island there was much concern with this storm for her family. I was able to befriend their pastor Jerry Valde, from Hillside Foursquare Church in Leyte Island, who assisted Lyn’s mother into safe haven during Hagupit. I told Pastor Jerry to give me an update once that the storm passed about pressing needs in Leyte Island. Last night, Pastor Jerry Face texted me the following. 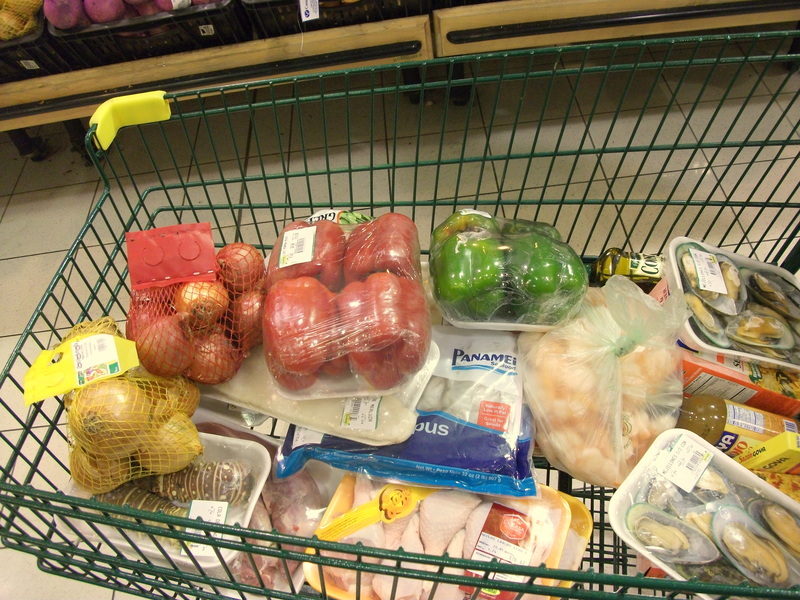 It’s clear that the urgent need in Leyte Island is food. I am requesting please for financial donations that our ministry, Emerging, Inc., will collect. A check will be issued to Lyn Ramirez who will send part to Pastor Jerry and part to her family in Leyte. You can also go to our web site at http://www.emergingusa.com/ and use the Donate Button almost at the top of the page. Emerging, Inc. is a 501 C3 Ministries registered with the State of Florida. We issue tax receipts at the end of the year towards your taxable deductions. Thank you! Pastor Jerry Valde and wife! What It Means To Be Single? 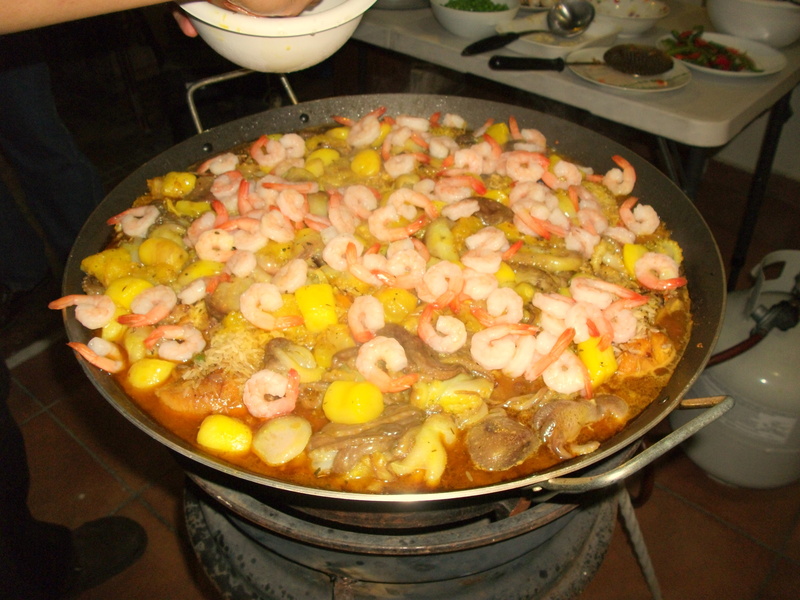 The Anthology Of a Santo Domingo Paella – Voila! 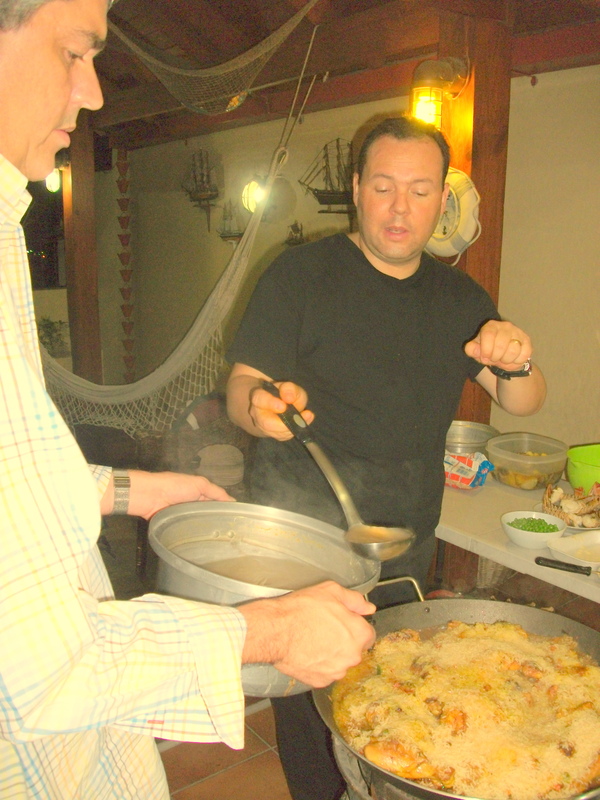 Master Paella Maker, Fernando Tapias, buying the ingredients in Santo Domingo, DR.
How To Make A Paella in Twenty Steps! My wife and I were invited to the Dominican Republic by our friends Fernando and Lorena Tapias. 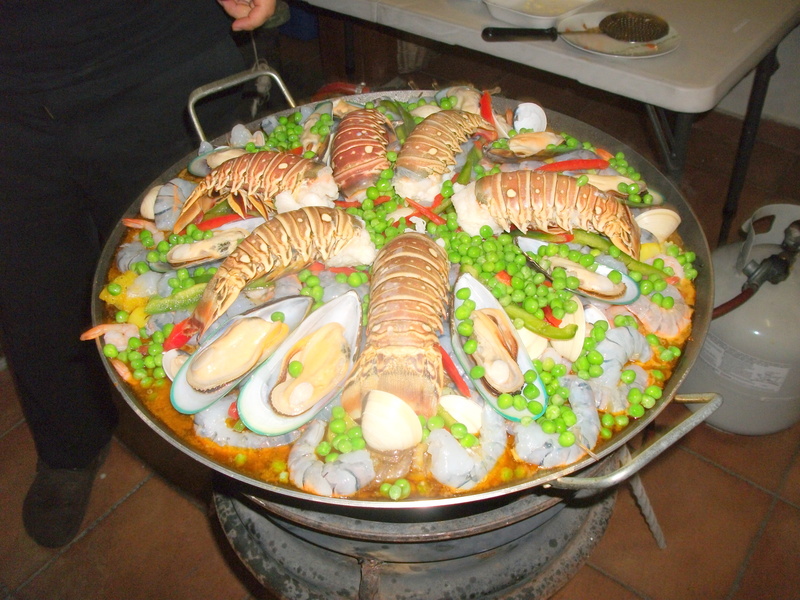 Fernando is known as a renowned paella chef. 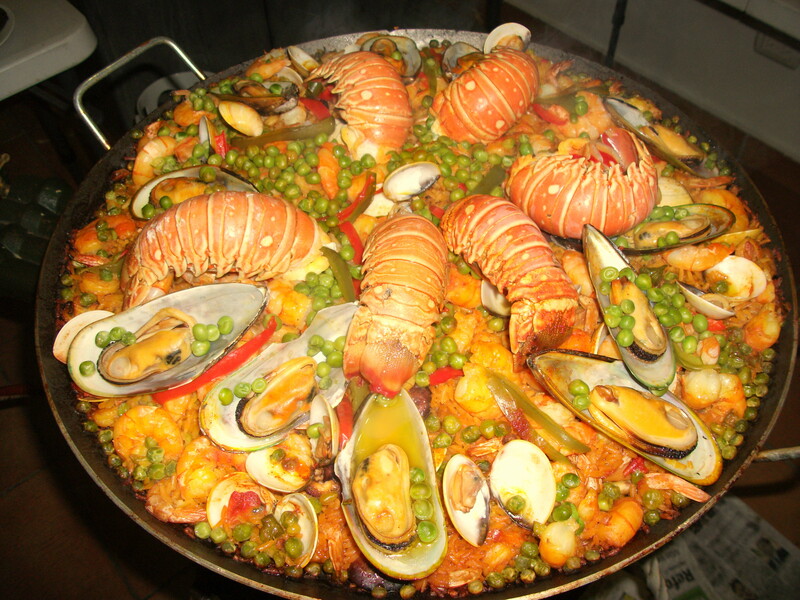 The paella is dish which includes yellow rice, chicken, and a variety of sea food, pimentos and peas. 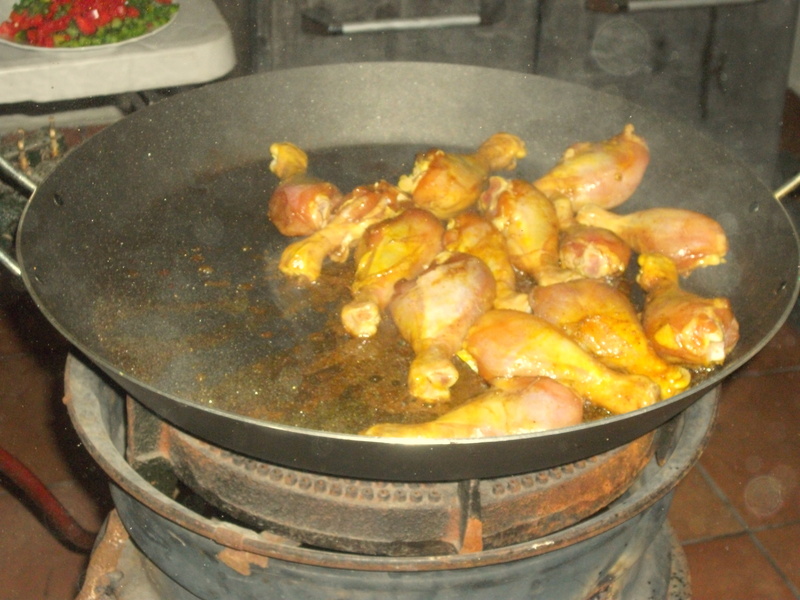 You can get it at exclusive Latin restaurants. The dish is expensive and can take an hour to cook, but, oh, is it worth it. 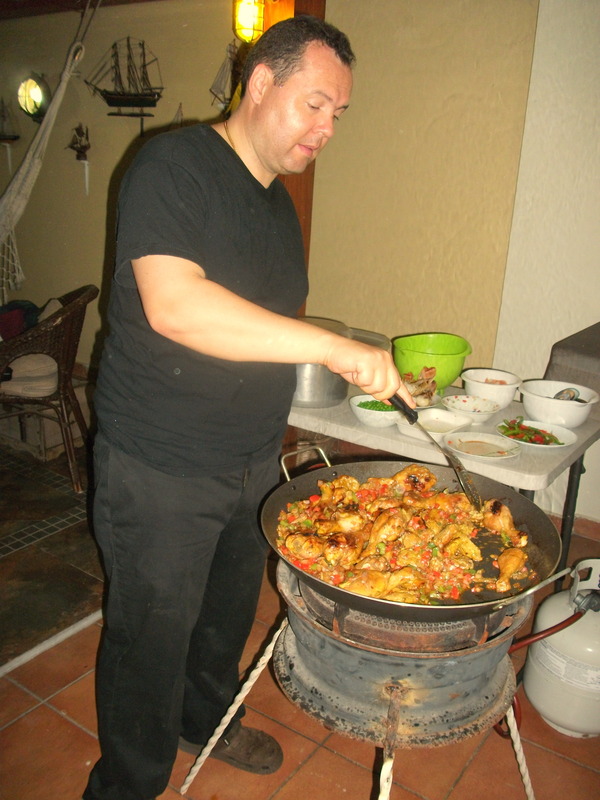 We were fortunate that during our brief stay, Fernando cooked for us. 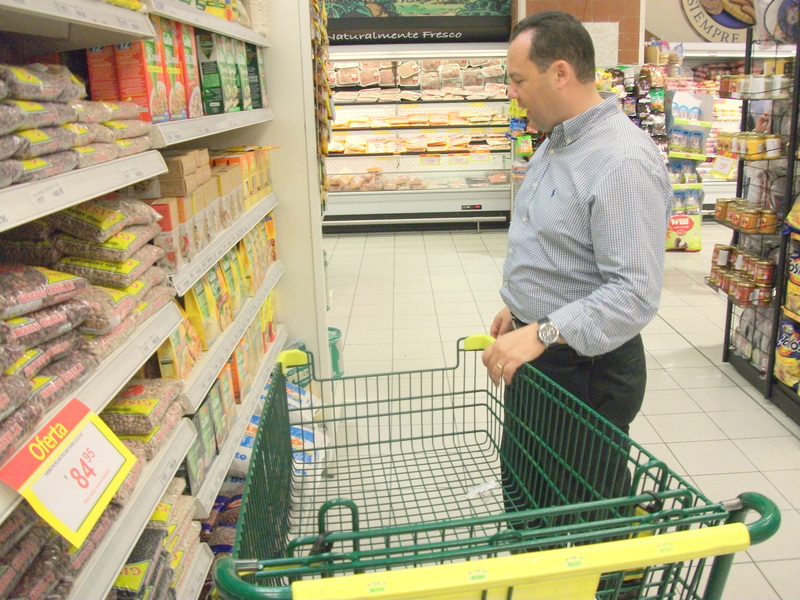 Fernando took us to a supermarket in Santo Domingo, capital of the Dominican Republic. You can notice his purchase. 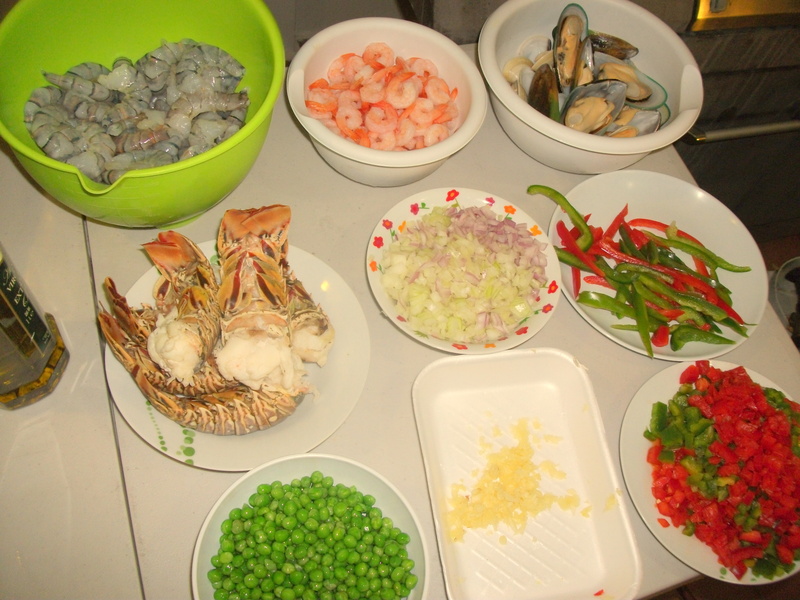 Red and green peppers, a variety of onions, chicken, shrimp, scallops, mini lobsters and seasonings. Yum! Fernando and his family lived in a beautiful pent house apartment overlooking the city of Santo Domingo. 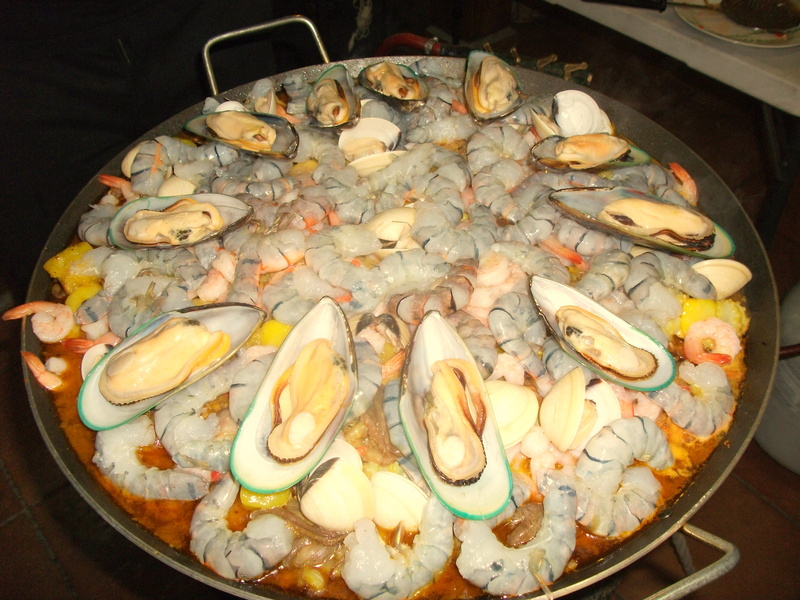 It was beautiful site, overlooking the city at night, while our mouths watered for the paella. 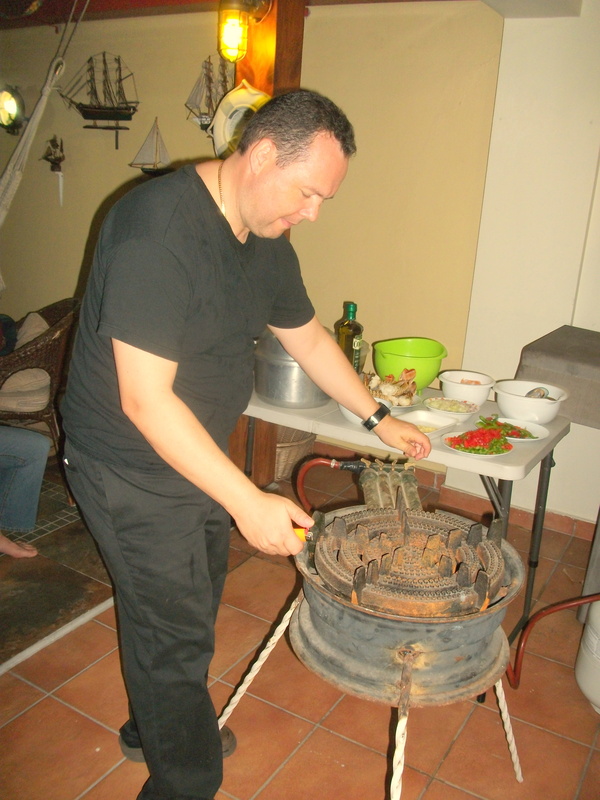 In this photo, Fernando lights his paella stove. 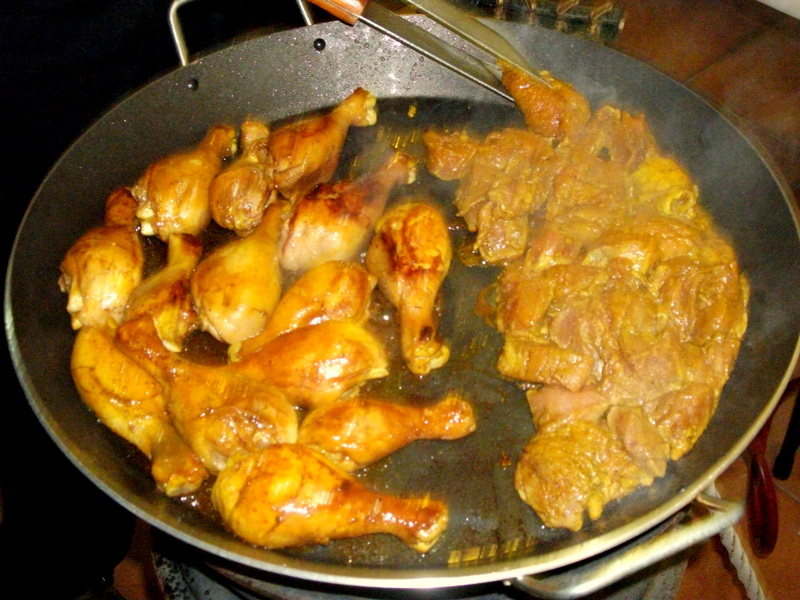 The first course of action was to brown the chicken in oil. 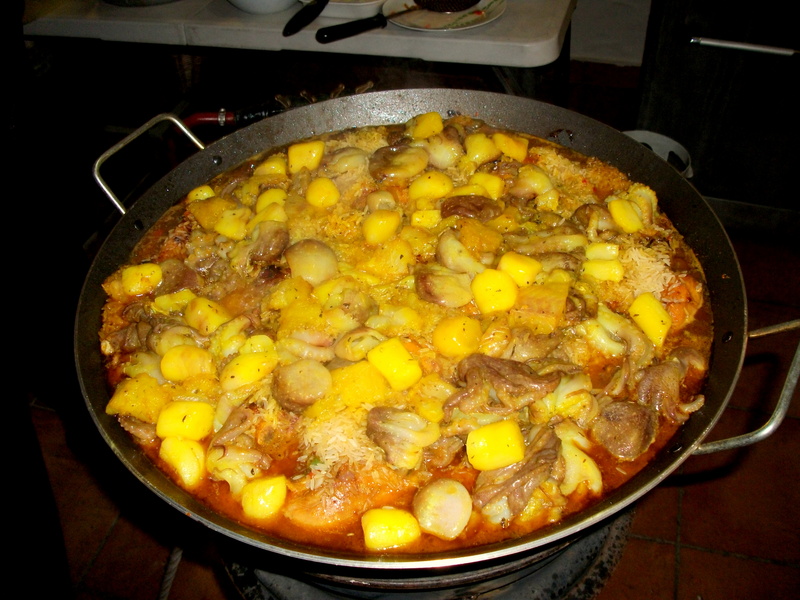 Next, Fernando did the same with pork. 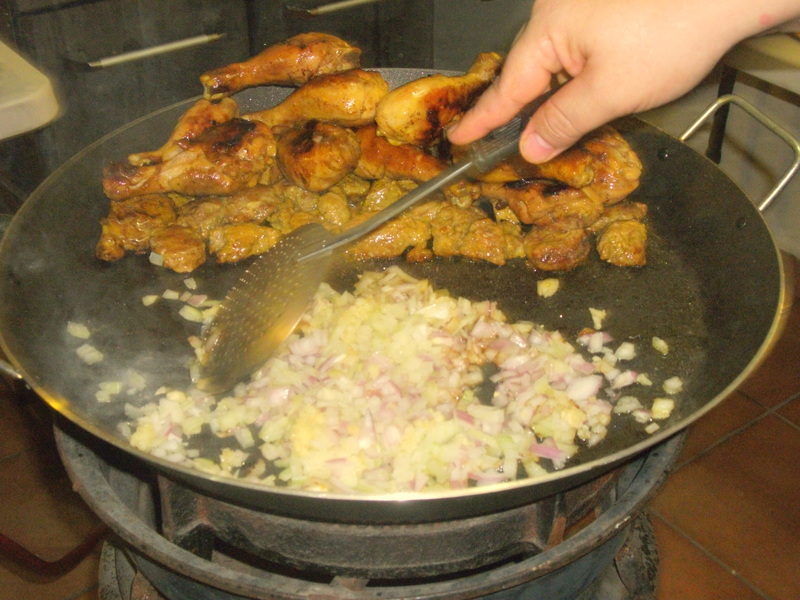 This is a combination of onions and garlic browned to perfection. Fernando browns a combination of red and green peppers. The master at work, browning, simmering, and blending. 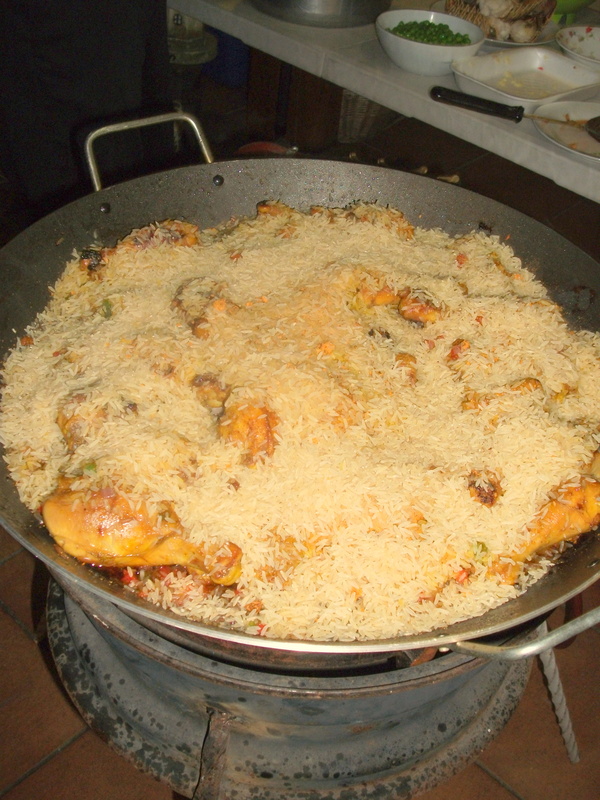 Next, Fernando distributes the raw rice over the dish. 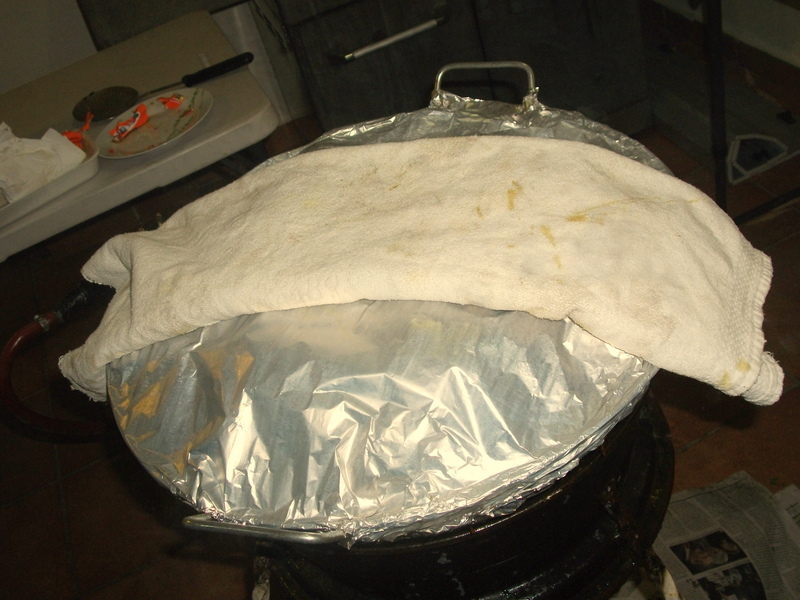 A guest was put to work by smothering the concoction with fish stock. 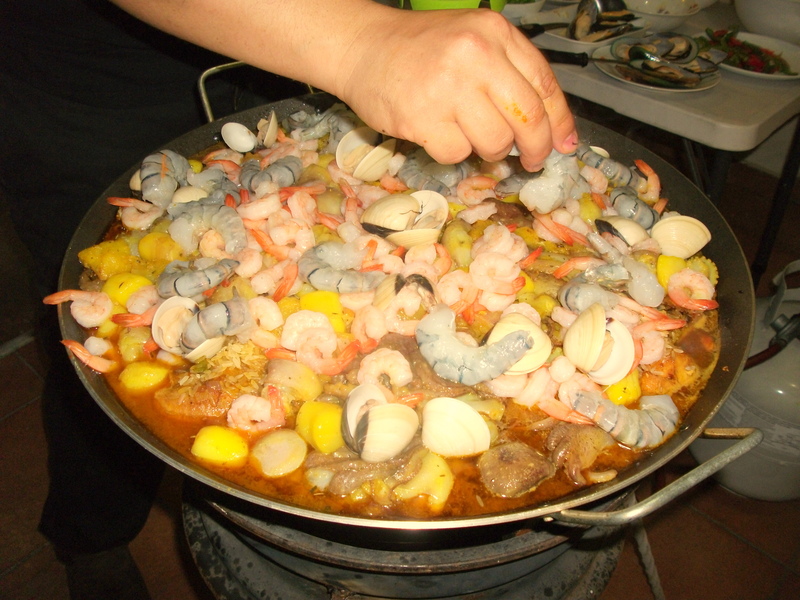 As the dish simmers Fernando adds baby octopus, fish and scallops. Amazing! 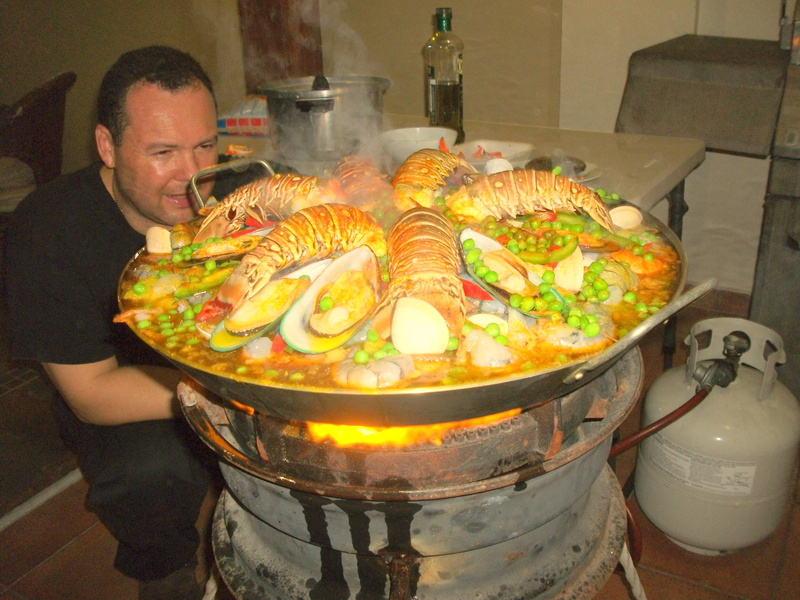 After that, Fernando adds shrimp. 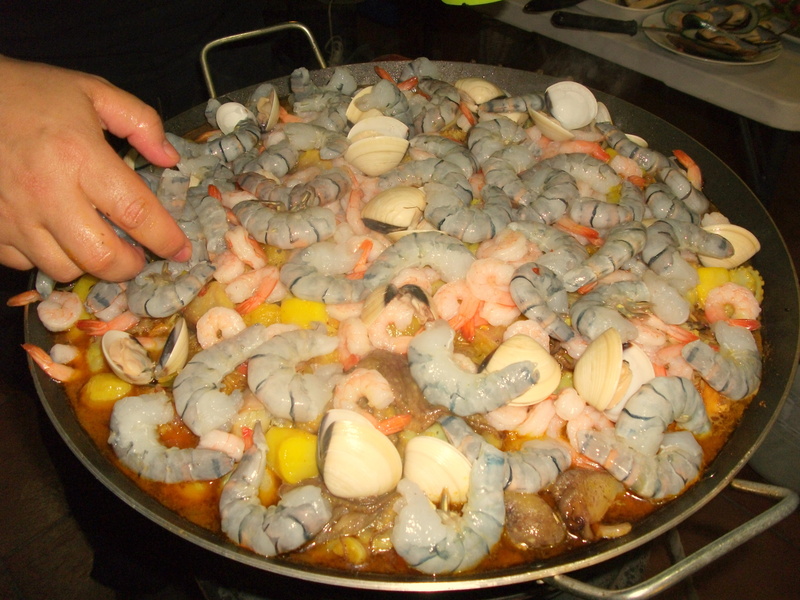 Next, another type of shrimp and clams! As if this was not enough, Fernando enhances the dish with mussels. 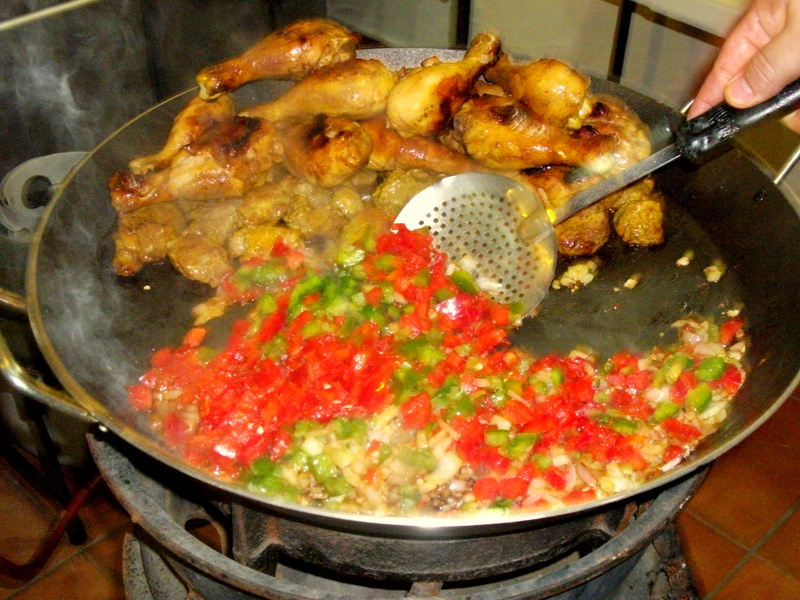 Red and green peppers and longostinas, which are small lobsters. Now, the famous peas which is the bedrock of a paella. The master, adjusting the flame to impeccable perfection. Voila! Such an incredible night of eating. 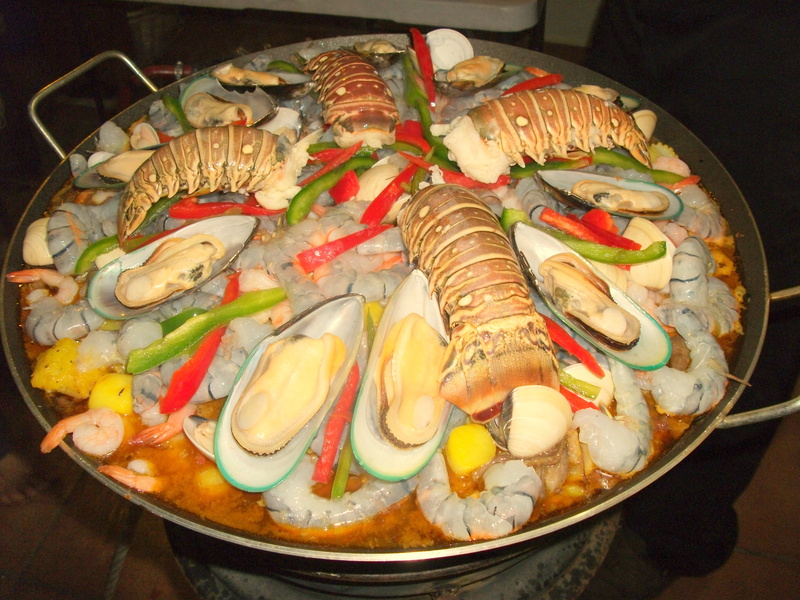 A sumptuous paella, a glass of wine, with great friends on the pent house porch overlooking the beautiful city of Santo Domingo. There Are Two Ways Of Eating! Mr 14:22 And as they did eat, Jesus took bread, and blessed, and brake it, and gave to them, and said, Take, eat, consume, and devour: this is my body. Joh 6:50 This is the bread which cometh down from heaven, that a man may eat, consume, and devour thereof, and not die. Joh 6:51 I am the living bread which came down from heaven: if any man eat, consume, and devour of this bread, he shall live for ever: and the bread that I will give is my flesh, which I will give for the life of the world. Re 2:7 He that hath an ear, let him hear what the Spirit saith unto the churches; To him that overcometh will I give to eat, consume, and devour of the tree of life, which is in the midst of the paradise of God. Re 2:17 He that hath an ear, let him hear what the Spirit saith unto the churches; To him that overcometh will I give to eat, consume, and devour of the hidden manna, and will give him a white stone, and in the stone a new name written, which no man knoweth saving he that receiveth it. Joh 6:54 Whoso is masticating, gnawing at, chewing, grinding, and crunching my flesh, and drinketh my blood, hath eternal life; and I will raise him up at the last day. Joh 6:56 He that is masticating, gnawing at, chewing, grinding, and crunching my flesh, and drinketh my blood, dwelleth in me, and I in him. Joh 6:57 As the living Father hath sent me, and I live by the Father: so he that is masticating, gnawing at, chewing, grinding, and crunching me, even he shall live by me. Joh 6:58 This is that bread which came down from heaven: not as your fathers did eat manna, and are dead: he that is masticating, gnawing at, chewing, grinding, and crunching of this bread shall live for ever.